Is it possible to recover lost files from a Laptop? My friend removed her laptop hard drive because the laptop was fried and put it into her desktop as a secondary. I am not here with her so I am just going by what she has told me but she can not access here documnents, pictures, music, videos, etc..The hard drive says it is only 15GB but she said it is a lot larger than that. I googled around a bit and still have no idea on how to access these hidden files. Any help would be amazing! Thanks! To be honest, data recovery for laptop hard drive is much more difficult than recovery for a desktop computer. The main reason is that all the components in a laptop are much smaller and harder to operate than the components in a desktop computer. Some people are required to take off the hard drive from the laptop and send it to a disk recovery repair shop and repairman will connect the hard drive to the motherboard of a large desktop PC to perform the data recovery. Along with the development of technology, we can make things much easier now! Read on to get the solution for how to get through the recovery task in one click. Recovering lost or deleted data from laptop hard drive could be as easy as pie if you know the basic acknowledgement of data loss issue that these lost files are just invisible and inaccessible on your laptop hard drive. You are able to recover them back before new files overwrite them. Therefore, getting back lost files from a laptop is not a big deal if you stop using your laptop or laptop hard drive at once when you find the files are lost, and then use a professional Coolmuster recovery program. One-click to restore lost files from laptop hard drive! Really? Instead of connecting your laptop hard drive with another computer to process the recovery, Coolmuster Data Recovery (for Windows 8/7/XP) or Coolmuster Data Recovery for Mac is able to work directly on Windows laptop and Mac notebook and retrieve a variety of deleted files from your laptop without any trouble, including videos, photos, music, documents, emails and etc. It can deeply scan your entire laptop hard drive and robustly retrieve files from laptop, MacBook, Notebook, iBook, etc. within minutes. 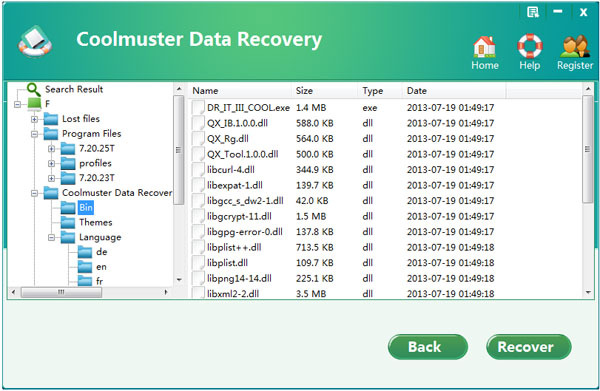 You can get a free trial version of Coolmuster Data Recovery right now to experience its functions in advance. Just download it from the buttons below according to your own system. How to Retrieve Deleted Files from Laptop? Only 3 Steps Needed! 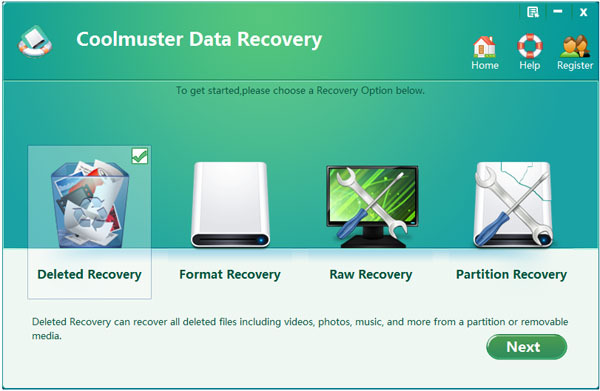 Now, let's take Windows version of Coolmuster Data Recovery as an example. Mac users can use the Mac version and follow the similar operations from Mac notebook. After downloading and installing the recovery program on your PC, launch it and select a recovery mode in the primary window to begin the process. To retrieve data from laptop, you can choose Deleted File Recovery mode as a try. The software will automatically detect and show all the partitions on your laptop. Just choose the partition where you lost files were originally located and click the button of "Scan" to scan for lost files. After a few while when the scan finishes, all the scanned out contents will be found and shown in categories. You are allowed to preview the found files one by one to confirm which are the ones you want to recover. Mark those files you want to recover and click the "Start" button to bring out the "Path" dialog box. Choose an output folder where you want to save the recovered data and then the recovery will begin. Please note that you should choose another partition to save the recovered data instead of the original one where you lost them. How can I recover data if the laptop no longer run? Above solution works on the premise that we can run the program on the laptop. But what if the laptop is crashed or failed to run? You can take off the hard drive of your desktop and try connecting it to another computer. 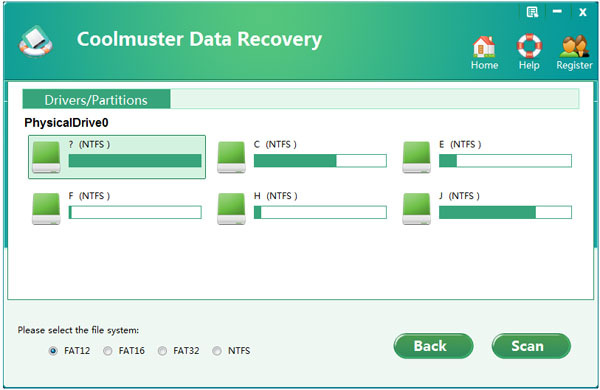 Once the hard drive runs well on another computer, you can use Coolmuster Data Recovery to perform the recovery process on that computer, too.